The Community Center Gallery space is richly appointed colonnade that serves as a pre and post function theater space equipped with track lighting for the exhibition of artwork and sculpture. Artist interested in showing their work can receive an application form by calling 952-227-7752 or click HERE to download one. Gallery Hours: Monday-Saturday 5:00 a.m. - 10:00 p.m. and Sunday 8:00 a.m. - 9:00 p.m. 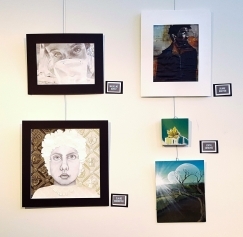 This diverse body of original work is created by Chaska High School students who have participated in three consecutive levels of an art discipline of their choosing. At CHS, students can elect to study Ceramics, Design & Digitial Art, Digital Photography, Drawing & Painting, and Global Arts & Jewelry. In each course, they learn content specific techniques while exploring and developing artistic concepts. Each student withing the Advanced level of these courses selected their favorite artowrk that they have created during high school. Their goal is to receive peer and community feedback to help inform and refine their artistic process. Our school, art department, and art students look forward to sharing these creative works with the public. We will be showcasing artwork done by the four and five-year-old preschoolers at Treks and Trails Preschool located here at the CCC. See what vivid imaginations these preschoolers have to offer. Ming Chiao Chapter builds on the mission of the Sumi-e society of America to promote the education and enjoyment of traditional and contemporary ink-brush art using East-Asian tools and materials. 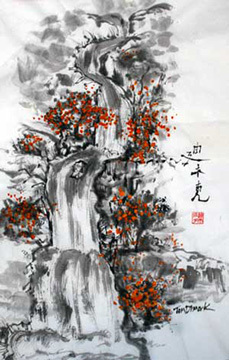 While appreciating classical approaches, Ming Chiao also encourages experiementation and non-traditional techniques. 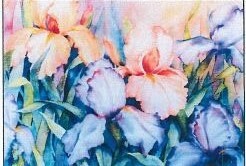 Barbara: I have always enjoyed painting with watercolors because of the transparency and free flowing qualitites of the paint. Since graduating from college with a degree in art. I have studied with nationally and locally known artists and continually take classes and workshops. My paintings have won numerous awards, and my commisions hang in homes, buisnesses, churches and restaurants in the U.S. and Canada. Elynn grew up on a farm near Plato, Minnesota and received a Bachelor of Science degree at the University of Wisconsin Stout in Clothing, Textiles and Design, minoring in Business. After graduation, married her high school sweetheart and travelled with his baseball career. During that time, she worked in the textile retail management. They decided to move back to their home town to raise a family. They were blessed with one daughter, Taylor Marie, a fun-loving teenager, who at the age of 16 years old, was tragically taken in a car accident. Elynn left her marketing/management job and has since been working in many mediums…. 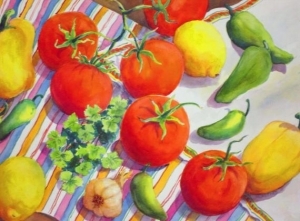 watercolors, acrylics, and textiles, raising money for the Taylor Marie Lepel Memorial Fund. This Fund donates and helps support Taylor’s favorite local organizations and Glencoe Silver Lake school activities and students. Her daughter, Taylor use to say to her, “Mom, why don’t you work in a career that uses your love of textiles and creativity?” So, Elynn is honoring her daughter’s wishes with her inspiration and keeping her memory alive.